Since the sun came out for the Hamburg summer in the past few weeks, I’ve been spending a ridiculous amount of time in the leafy parks across the city. Whether I’m picnicking with friends or reading by myself, I’m constantly in a haze of wonder at the beauty and diversity across these grassy city retreats. And I’m not just talking about the whispering trees and blooming flowers; I’m talking about the humanity! Everywhere you look there are humans engaged in the most diverse range of activities. From sports to picnics, we’ve got you covered with everything you’ll need to have a parkfect day out. Take a blanket or rug big enough for your group of pals (or yourself!) to sit on. Don’t underestimate the power of the german sun, you CAN get burnt! If it’s hot, take some sunscreen. If you’re by yourself, take a book to read and find a shady tree to relax under. Sports! 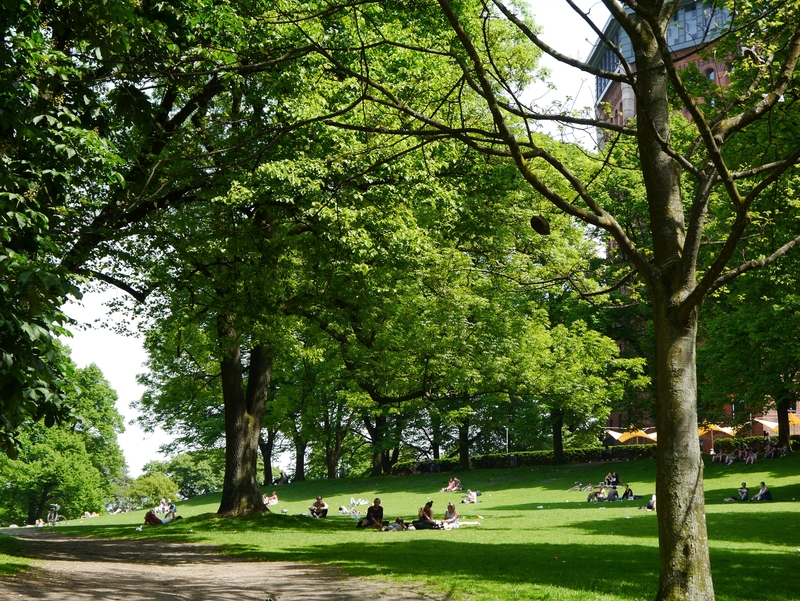 Throughout hamburg’s parks you will find an endless array of activities going on; there’s slack lining, tennis, bowls, badminton, football, hula hoops, juggling, cycling, skateboarding and acrobatics; to name a few! So if you can, head down to the park with a football or hacky sack so you’re not overcome with jealousy of all the fun everyone else is having. If you don’t have any games to take to the park you can always chat the the lovely people with the slack lines, they are usually happy to give you a go! Or take a deck of cards to pass the time with friends. Food. Take a picnic lunch with you for the cheapest alfresco meal in the city. The local supermarkets (like Edeka) sell nifty little BBQ sets, a foil tray of coals with a mini grill on top. Pick one of these up for around €3 and some bratwurst and you’ll be having a right ole German time. They are SO easy to use, and you can cook just about anything on them, right there in the park. Drinks. 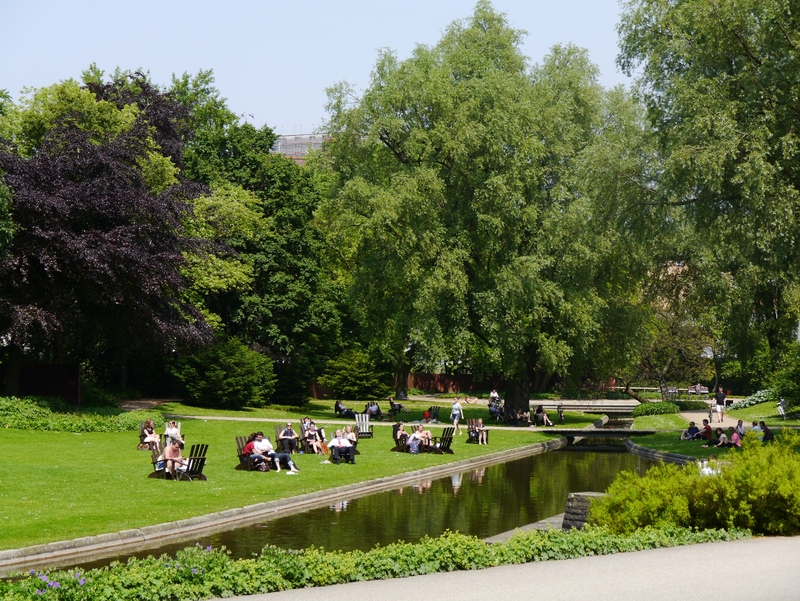 It is legal to drink on the streets of Hamburg, and yes… this includes the parks. Pick up some cold beers or a bottle of wine to add to you picnic. At 47 hectares in size, Planten un Blomen is one of the largest parks smack bang in the middle of the city. This park is great for wandering around, visiting the different themed gardens and taking in the perfectly manicured landscapes. They offer free deck chairs for you to enjoy the sun on and there are amazing fountains and sculptures scattered across the grounds. There are also cafes and ice-cream shops, and even water-based games for the kids to play (for free). Wohlers Park is an old cemetery, tucked away in the St Pauli district. Don’t be turned off by it’s title as a cemetery though, this park couldn’t be more full of life. Tree lined paths weave in and out of hidden glades, picnic areas and open meadows. What I love most about this park is that despite its smallish size, you can still get lost in it due to the clever planting of trees and bushes that create so many hidden little parts. On a weekend the large open areas are full of people having picnics and playing sports. The overall vibe here is amazing and it is one of my favourite places in the whole city. 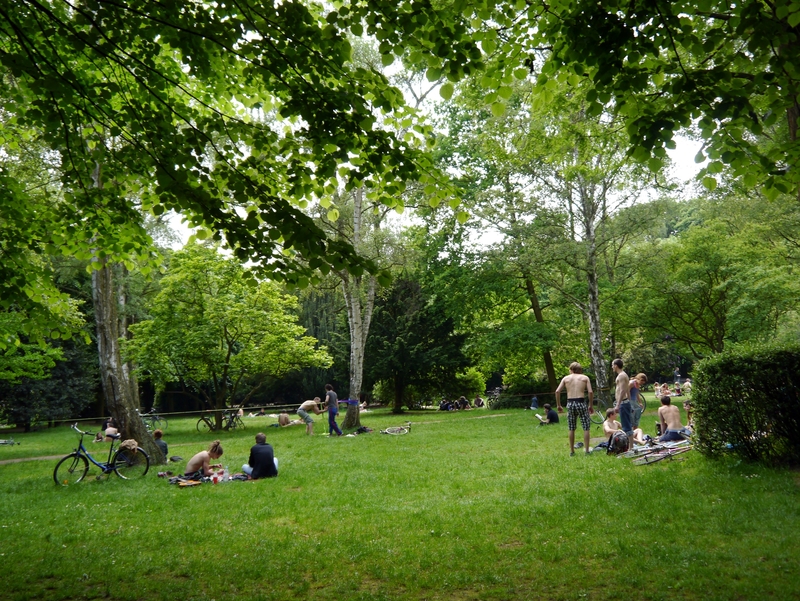 Schanzenpark is located just behind Sternschanze U-Bahn station. The park itself is quite big, but the particular area I am talking about here is the main hill. Everyone gathers on this hill that catches the afternoon sunshine and every ray right until nightfall. Because of the angle of the hill towards the sun it’s great for sun bathing, but it’s also where people go to drink and hang out. There is usually a dude with a guitar or sound system as well sharing music across the grassy knoll. If you want to relax, perhaps try another park; if you want to party before the sun goes down; try the hill.